Winegrowing never has an easy road ahead. But, each new laurel bestowed to a locally-grown bottle reaffirms its serious potential in Malta. Amazing triumphs that few people imagined possible have been achieved already. Now the Delicata winery has done it again. 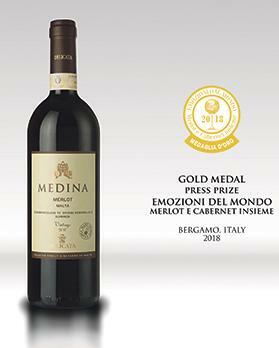 The winery’s outstanding 2017 Medina Merlot, DOK Malta, Superior won a Gold Medal and the Premio Della Stampa at the Emozioni dal Mondo Merlot e Cabernet Insieme 2018. The wine competition is organised in Bergamo, Italy by the Vignaioli Bergamaschi S.C.A. It reviews exclusively wines made from Merlot, Cabernet Sauvignon and Cabernet Franc. The result adds another two medals to Delicata’s roll of 130 awards. The winery’s list of accomplishments is long and might have become so lengthy that winning on the big stage gets taken for granted. Of course, the challenges the Maltese wine sector faces are neither tied nor overcome by counting trophies. But let’s not brush aside the successes or all too quickly take the complete self-deprecating stance. An Olympic Games medallist isn’t expected to hide any medal in a dresser drawer. Neither should an honoured winemaker have to. Besides, silencing accomplishment would do a disservice to all those people that have been helpful and supportive along the road to victory. The latest two prizes for Delicata’s Medina collection of Maltese wines, lest we forget, are also the achievement of the dedicated vignerons that supply the Delicata winery each year with quality grapes. Accolades like these, which don’t come easy, send a positive signal to Malta’s heavily tried agricultural sector at large. The message is that there’s never been a more rewarding time to grow wine grapes, the most profitable permanent crop which is in undersupply in a ready and growing wine market. Keeping the good news from wine afficionados wouldn’t be reasonable either. Studies show that consumers are lost among the diversity and complexity of wine. Medals bestowed by wine professionals play a useful part here. They offer reassurance and help with making a more informed choice. Competitions also encourage winemakers to do better and, all together, raise the standard of a country’s wine industry by holding it to international benchmarks. At this year’s Emozioni dal Mondo Merlot e Cabernet Insieme, 85 critics from around the world made up the judging panels. The Organisation Internationale de la Vigne et du Vin oversaw the legitimacy of each gold medal. A special commission of wine journalists adjudicated the Premio Della Stampa, a press prize for a country’s highest scoring wine. Delicata’s Medina Merlot passed all their criteria, won and did Malta proud. But, best of all, it’s a well-crafted, genuine bottle of wine. The mature vines selected for this ruby-red grow at 50 to 220 metres above sea level. The hillside parcels are often surrounded by typical Mediterranean garrigue scrubland where thyme and rosemary still grow wild. The Maltese sun offers no respite; our arid soils close to the bedrock give little nourishment. At night, cool marine winds keep the grapes healthy. At optimum ripeness, the crop is hand-picked at dawn to preserve nature’s gift. Bunches get destemmed, single berries sorted, crushed and fermented after a cold soak in tank. Finally, a gentle pressing safeguards bright colour, fruity flavours and silky tannins. Medina Merlot of Malta is expressive of our land, climate and skilled human hands, all rolled into one.